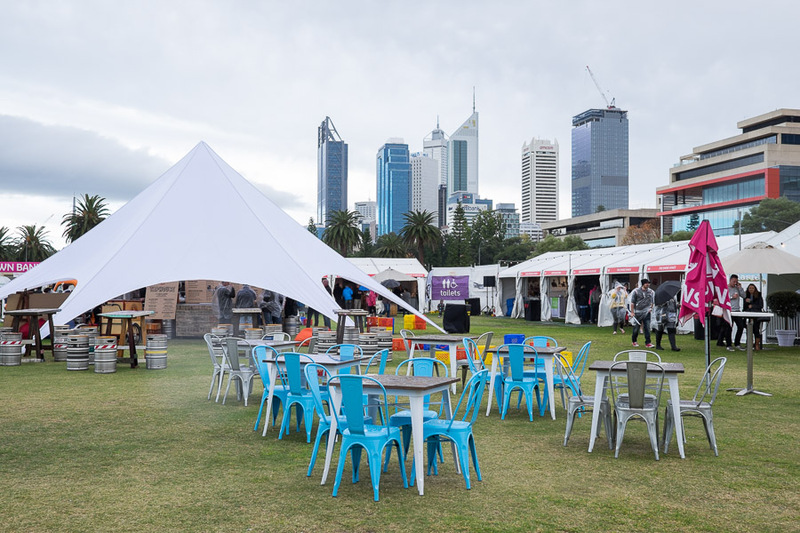 With the city skyline on one side and the Swan River on the other, Langley Park is a gorgeous venue for an outdoor festival… as long as the weather cooperates. 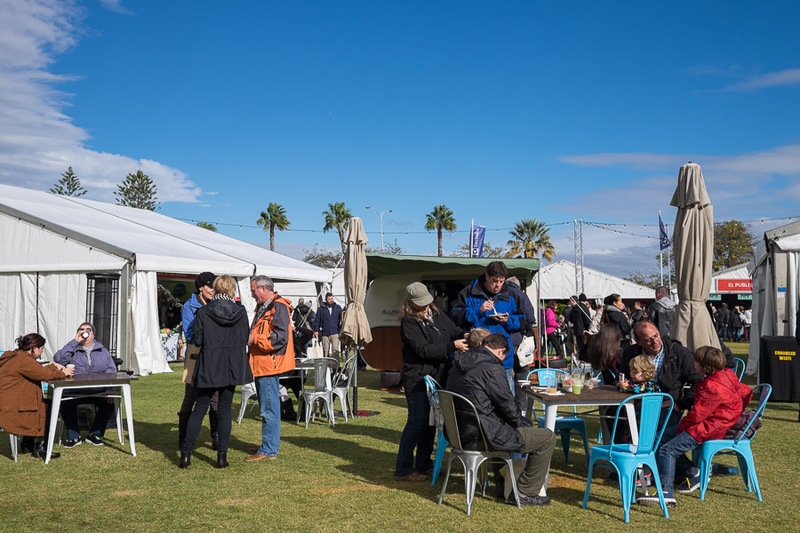 Unfortunately, after weeks of sunshine, we had a blustery and extremely wet weekend for the second Taste of Perth. 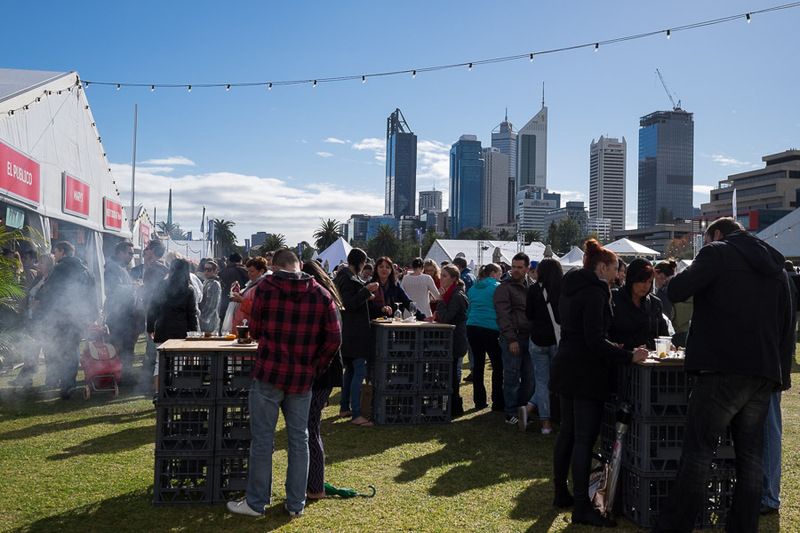 By way of disclosure, I went to Taste of Perth twice – Friday and Saturday lunch. 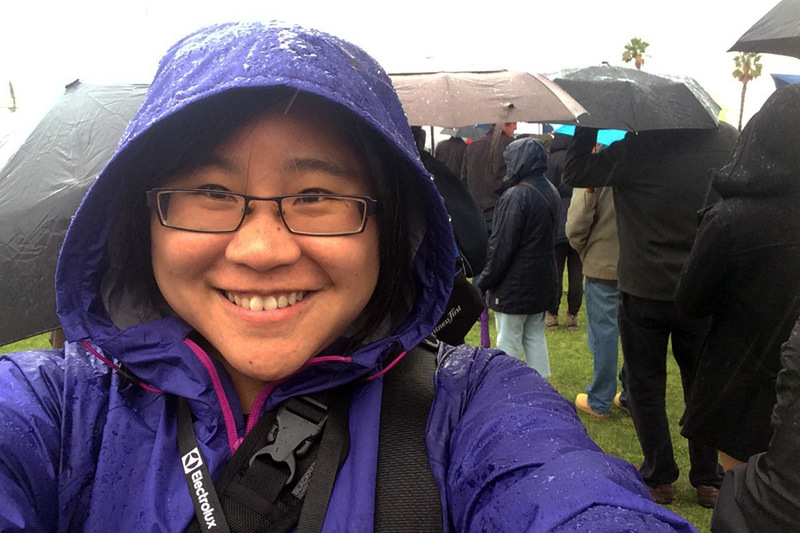 Friday was by invitation to an Electrolux VIP experience; stormy Saturday was with Jac. We had complimentary General Entry tickets for Saturday. Please see the notes at the end of this post for more details. 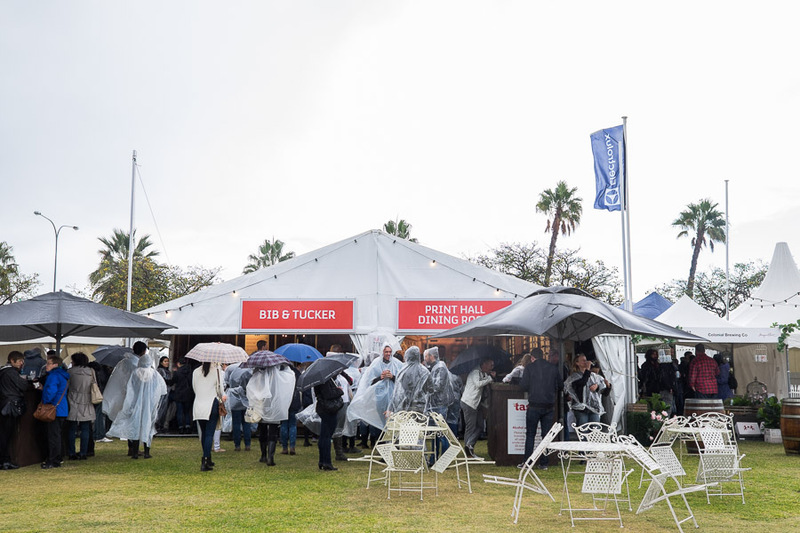 Ponchos were free but given the weekend forecast of heavy rain and storms, it would’ve been wise to set up extra marquees to provide more covered dining areas. While it rained, many seats and tables were unusable as they were out in the open, which was a shame. 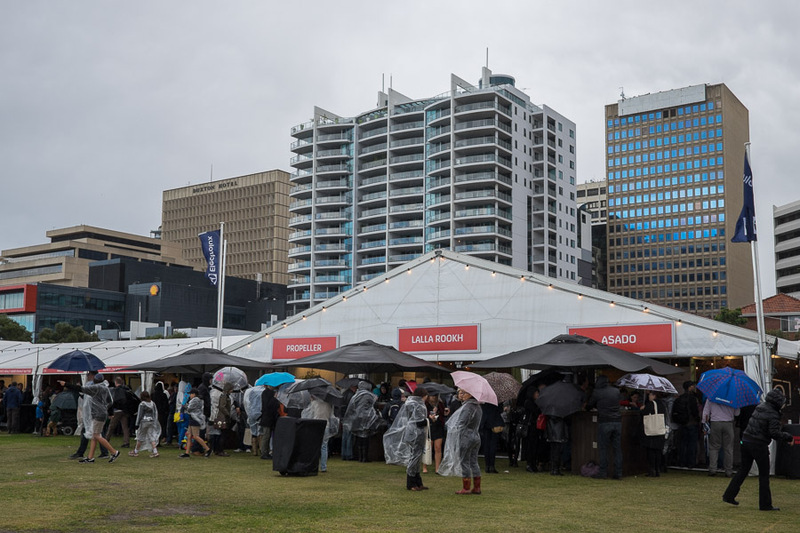 We huddled under umbrellas and the restaurant marquees to eat our food, but if more people had braved the weather, there would not have been enough places to shelter from the rain. 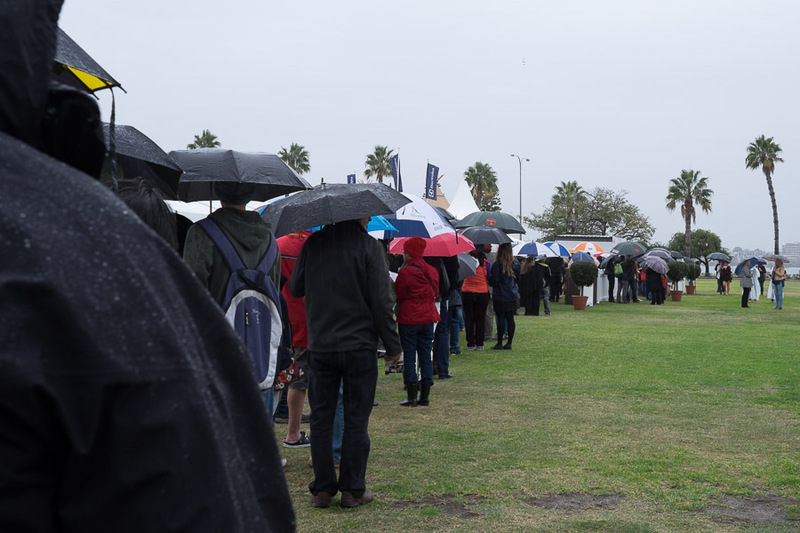 The heavy rain and gusty winds would’ve kept the numbers down, but it was good to see a decent crowd waiting at the gates for the start of Saturday’s lunch session. We drove in to the city and parked next door in the Terrace Road car park. Wet and cold, hungry and excited! 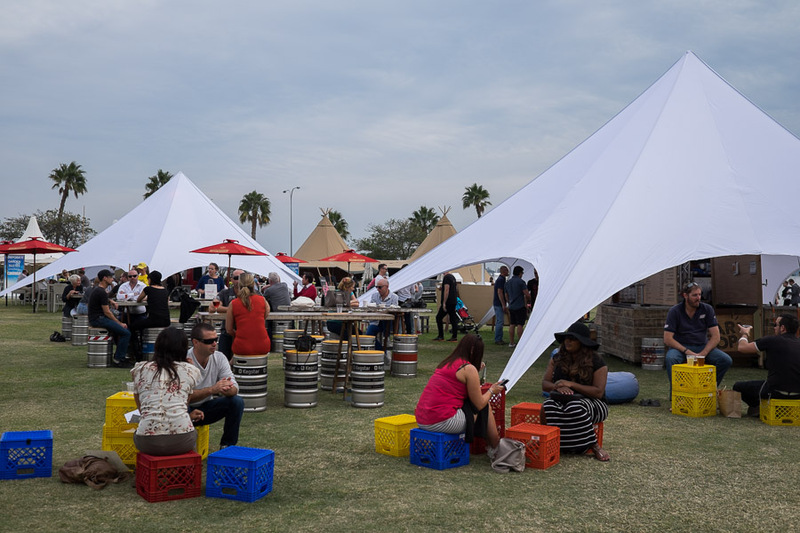 At Taste festivals, you pay for food and drinks with crowns; 1 crown equals 1 dollar. Your crowns are loaded onto a card, so paying for items is done simply by scanning the card. On rainy Saturday, there were no queues at the Crown Bank and it was easy to wander over when we needed to top up our card with more crowns. There was no pressure to ensure you used up all your crowns; you could get a cash refund for unused crowns before leaving the festival. 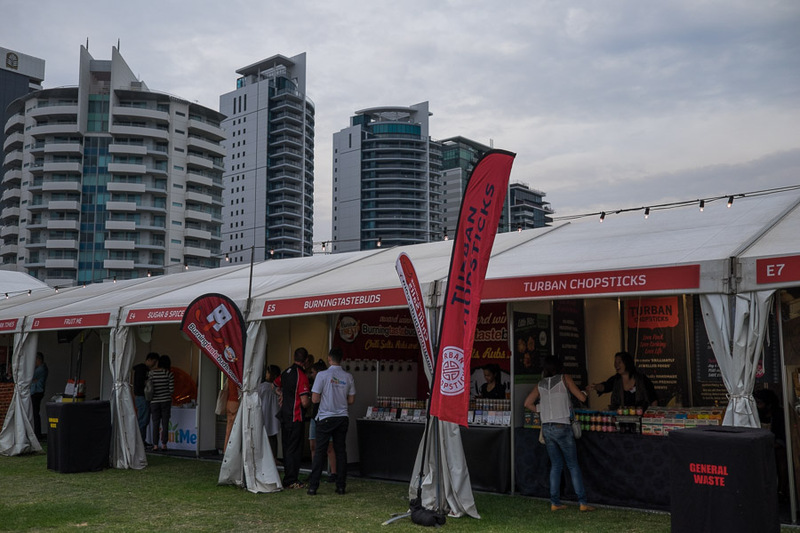 To be honest, I initially thought the crowns concept was just a gimmick, but I can now see how convenient it was for stallholders – transactions were quick, and I liked not having to muck around with change. The question of what represents good value for money at a restaurant regularly generates debate in Perth. I was impressed with the quality of the dishes I tried and thought they were reasonably priced. Every restaurant (apart from Lalla Rookh Wine and Salumi Store) had one 6 crown dish. Most dishes were priced from 8 to 12 crowns. Of the 51 restaurant dishes, four were 20+ crowns and three were 30+ crowns. 8 restaurants featured a dessert dish. 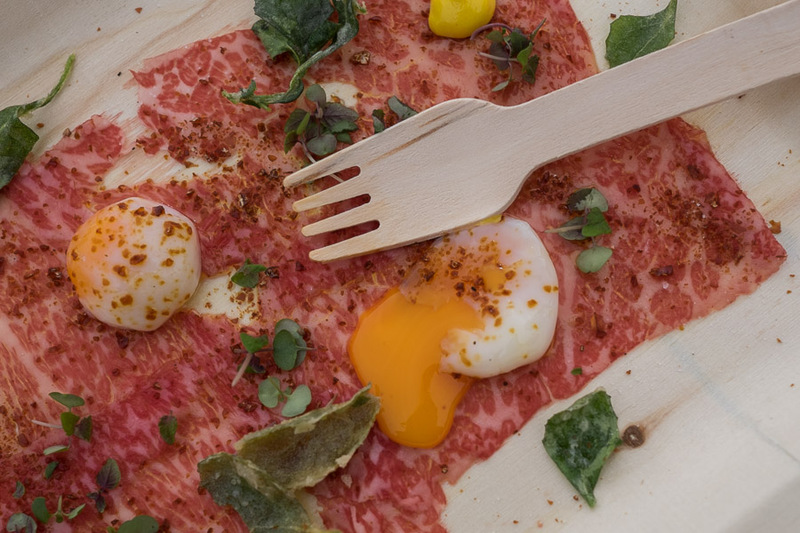 As a VIP guest on Friday, I tasted the most expensive dish of the festival, Nobu’s Icon Dish of 9+ Wagyu Carpaccio with quail egg, soy salt and the Nobu signature South American twist, aji amarillo aioli. Priced at a princely 32 crowns, it was a treat for the senses, with soft marbled beef, bursty gooey eggs and umami seasoning, all destroyed in seconds. If I’m being perfectly honest, I probably wouldn’t have forked out 32 crowns just from reading the menu description. But now I’ve tasted it, I realise I’d have missed out on a spectacular dish. 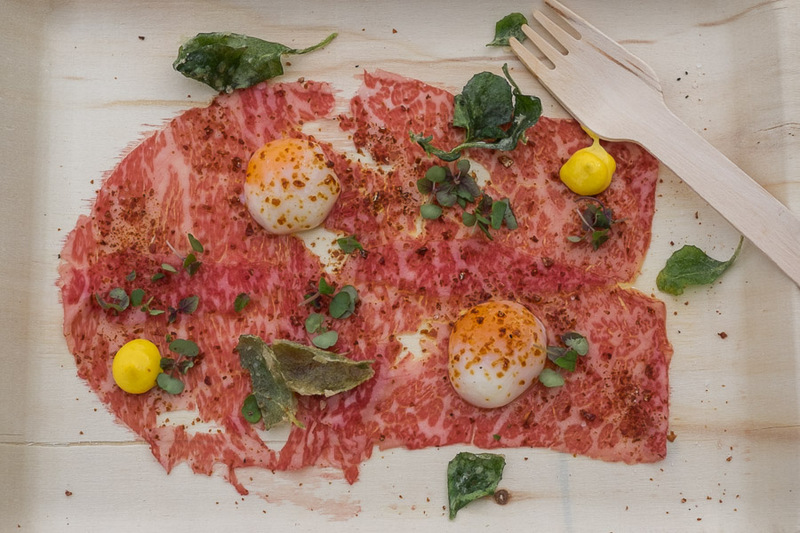 Nobu’s Icon Dish: 9+ Wagyu Carpaccio with quail egg, aji amarillo (amarillo chili) aioli and soy salt (32 crowns). 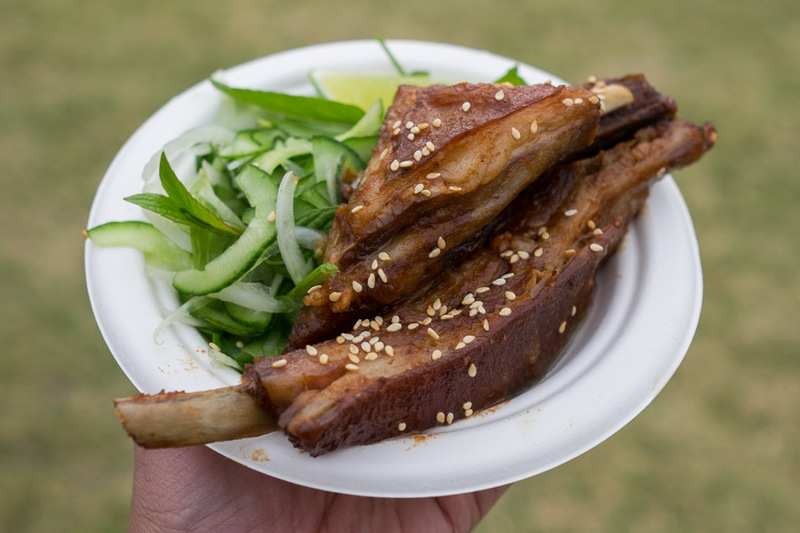 el Publico took the Best in Taste honours with their twice cooked Lamb Ribs, meaty slabs with layers of gelatinous fat, and sesame, cucumber and lime (12 crowns). I declared on Friday that lamb is the new pork – this dish makes a compelling case. 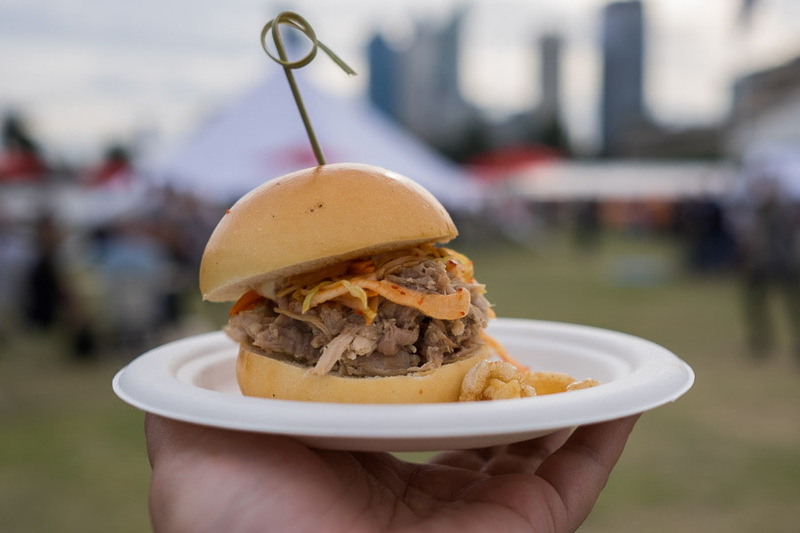 Bib & Tucker: Rotisseri Suckling Pig Slider – kimchi slaw and Kewpie mayo (8 crowns). I think sliders have just about had their day, but this one was terrific, with a chewy bun, excellent meat to bread ratio, funky sour tang from kimchi and the magic of Kewpie mayo. 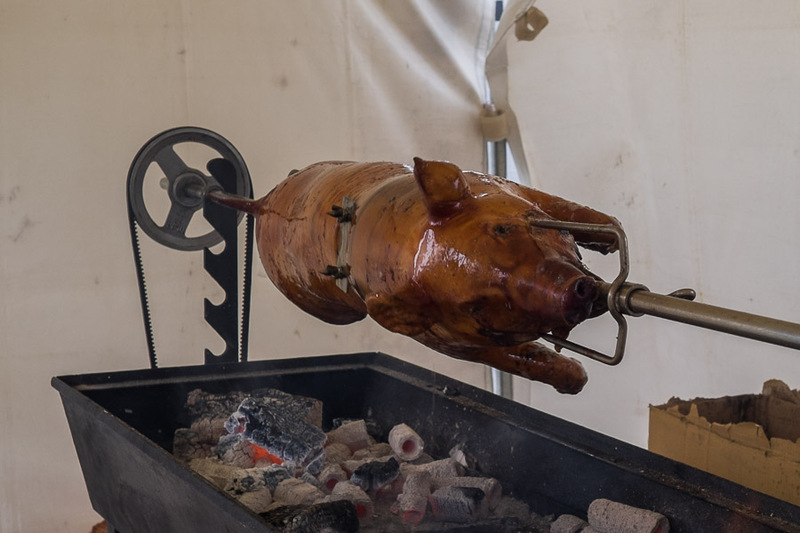 I am always mesmerised by meat turning on a spit – this is the suckling pig at Bib & Tucker’s restaurant. Mary’s: Fried Chicken Wings, Kewpie, Roe – two fried wings, boned and filled with Kewpie mayo, roe and sauce (8 crowns). Molten filling to burn your tongue, sauce to drip on your clothes – here’s where the rain poncho doubles up as a handy eating poncho. 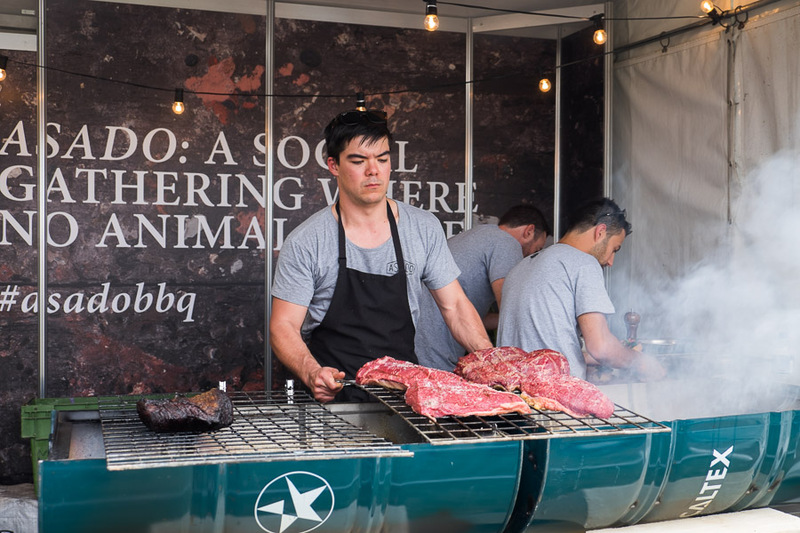 With fire, smoke and enormous slabs of barbecuing beef, Asado won the honour of ‘Best Dressed Restaurant’. 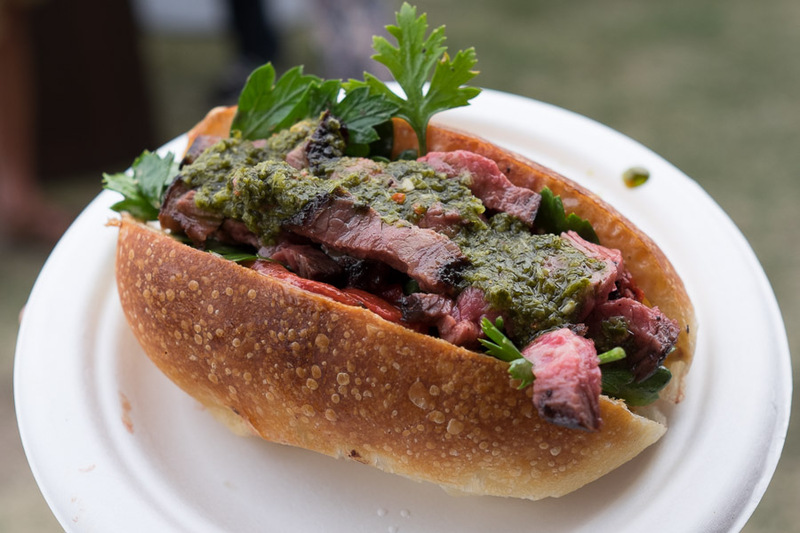 Asado: Lomito – BBQ’d rump cap, loose-leaf chimichurri, chipotle mayo and salsa criolla (8 crowns). 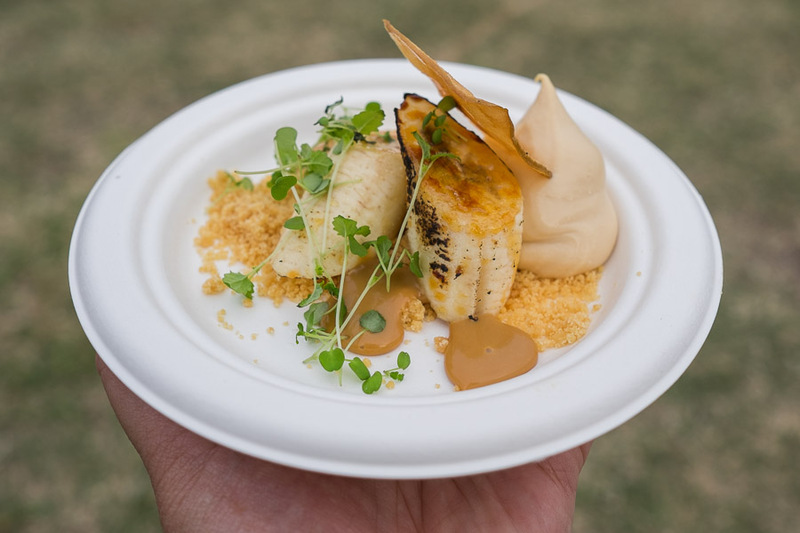 Asado: Burnt Banana – with butter biscuit (crumbs), dulce de leche, mascarpone and Pedro Ximénez (6 crowns). An outstanding banana dessert and a steal at 6 crowns. I’m hoping to dine at Asado in the near future and will be tempted to order this dessert in full size. 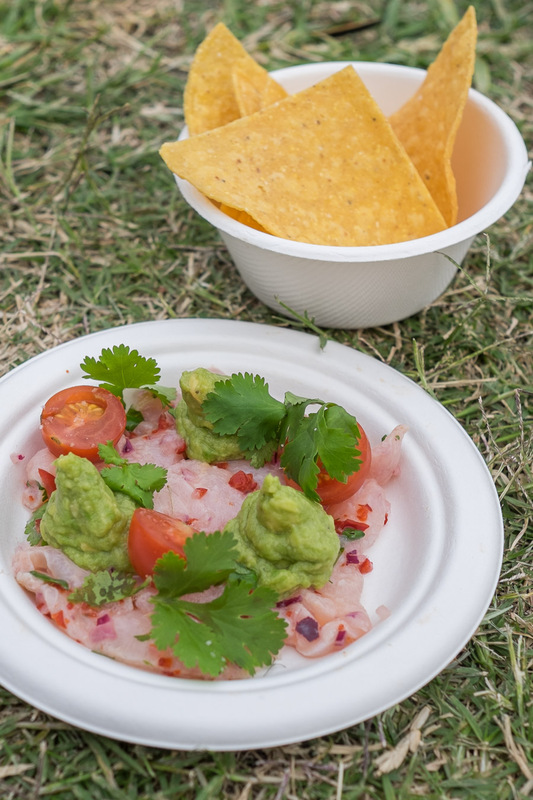 Asado: Ceviche – market fish, avocado, coriander, lime, chilli, cherry tomatoes, house tortilla chips (12 crowns). It’s the weather for hearty casseroles but I cannot get enough ceviche right now! Loved the freshness of the fish with the tart lime juice and little hits of chilli. Friday afternoon, before the weather turned. The rest of the food pictures come from Saturday. 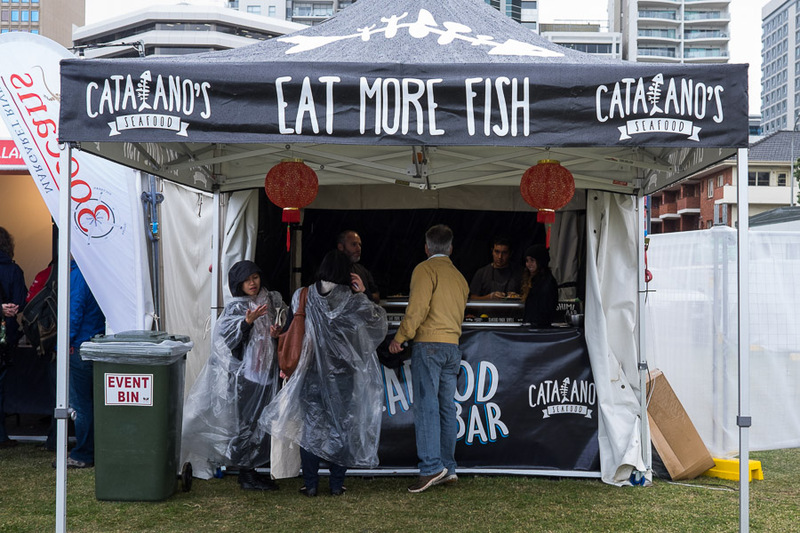 My favourite dish wasn’t from one of the official Taste of Perth restaurants; it was from Catalano’s Seafood Bar, which I almost missed. Hiramasa kingfish sashimi served with shredded cabbage, bacon crumbs and tobiko (flying fish roe). The tender slices of shiny fresh kingfish with crunch and pop is one of the best things I’ve eaten this year. Yes… wow! 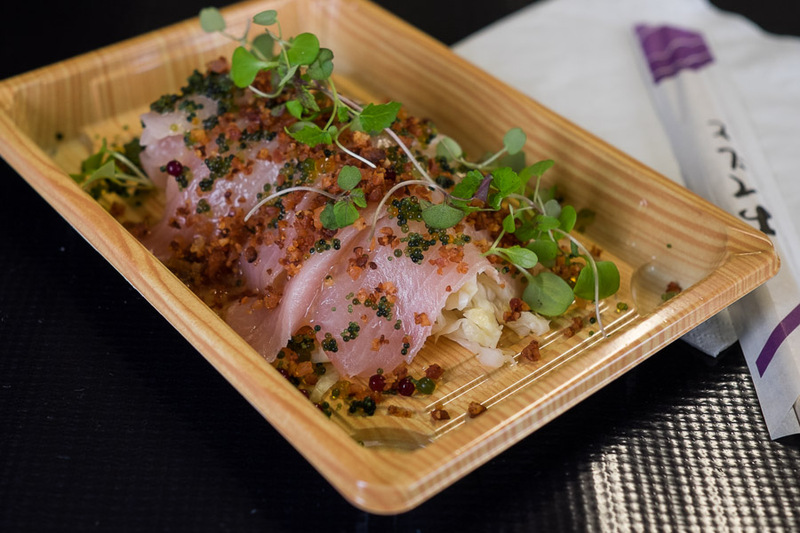 Catalano’s Seafood Bar: Hiramasa Kingfish with bacon crumb and tobiko salad (14 crowns). PS. Catalano’s Seafood has just opened at Westfield Whitfords City, selling ready-to-eat and fresh seafood. 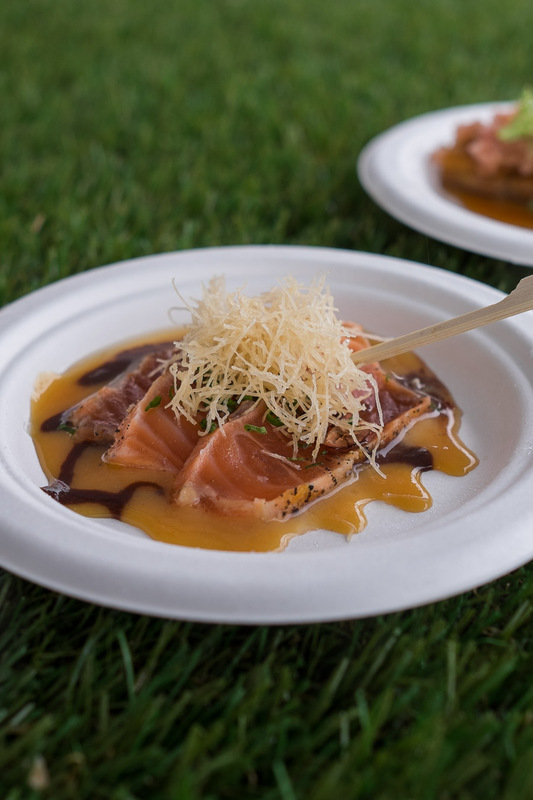 Nobu: Seared Salmon Sashimi – chocolate, yuzu karashiso miso, cocoa nibs and fried katafi (10 crowns). Enjoyable, though very sweet, almost like dessert. 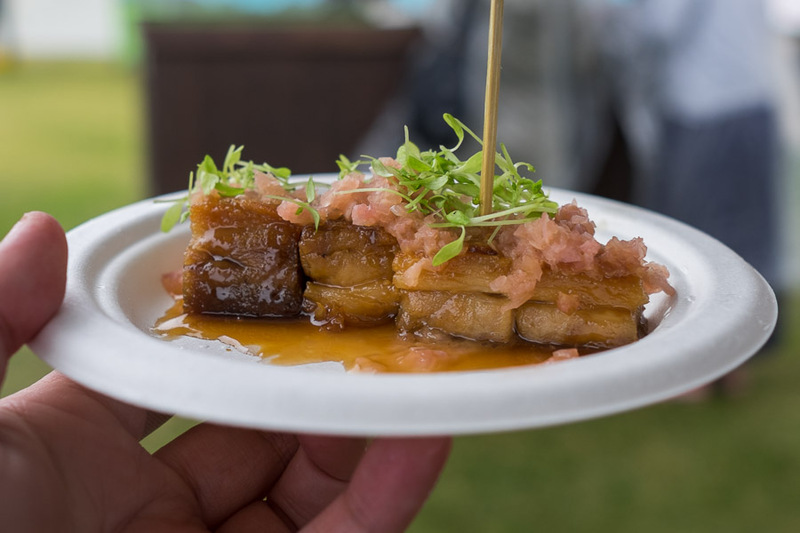 Nobu: Linley Valley Pork Belly with spicy miso caramel sauce and ginger salsa (12 crowns). No crackle crunch, but the chunks of pork were deliciously succulent. 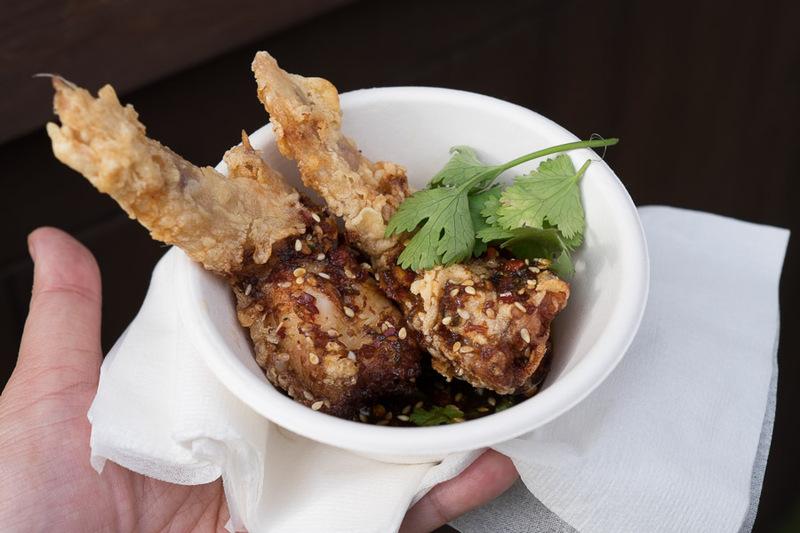 The miso caramel sauce and pickled ginger salsa were a unique twist on sweet and sour. 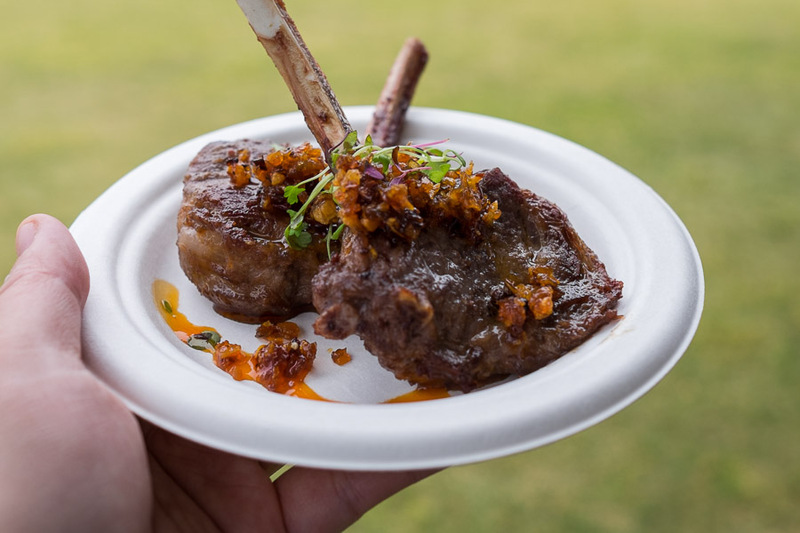 Silks: Szechuan Lamb Cutlet with chilli and cumin (12 crowns for two cutlets). Buttery tender, flavoursome lamb with a tasty caramelised chilli garnish; not as spicy as I had expected. We were pleasantly surprised to receive $30 gift cards with our purchases at Nobu and Silks – one for Bistro Guillaume and one for Silks. 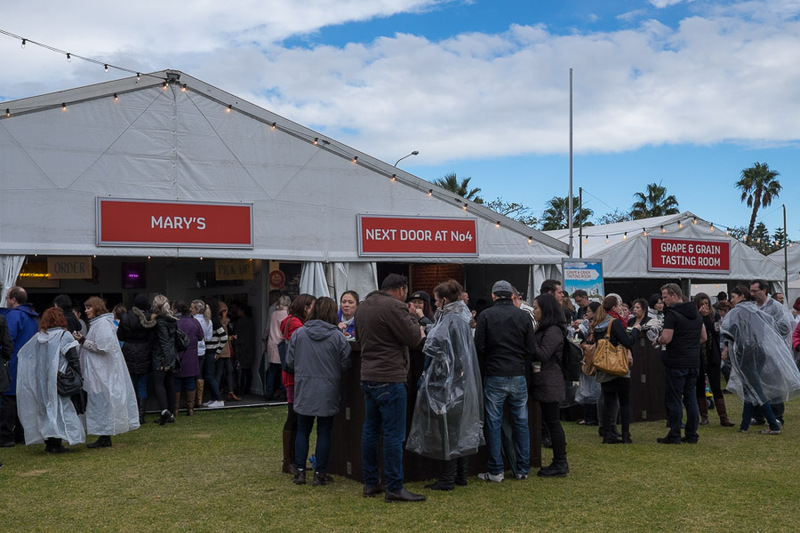 There is fine print: minimum spend of $150 and to be used by 30 June 2015, excluding Saturday nights, but even then, it’s a clever way to promote the Crown Resort restaurants and get the punters in. 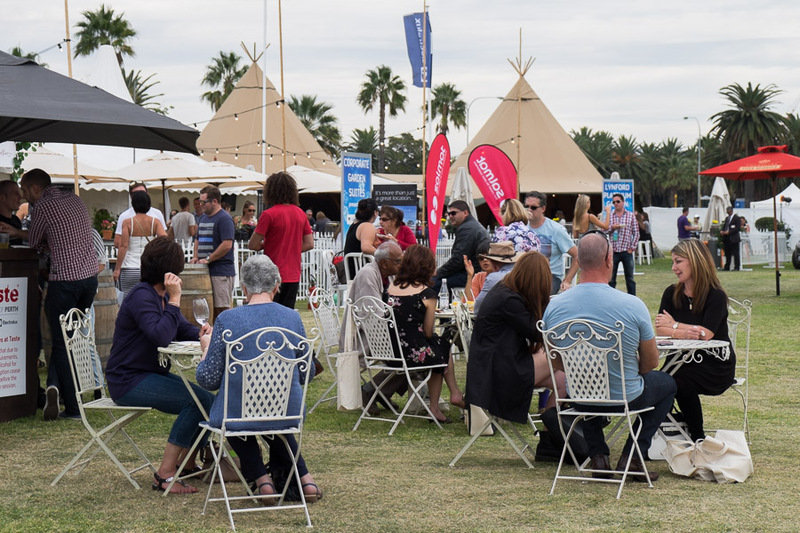 Gift cards were being given out at all of the Crown restaurants at Taste of Perth (Nobu, Silks, Modo Mio and Bistro Guillaume). If you’ve been to Bistro Guillaume at the Crown, you’d recognise its distinctive green even before reading the words ‘Bistro Guillaume’. 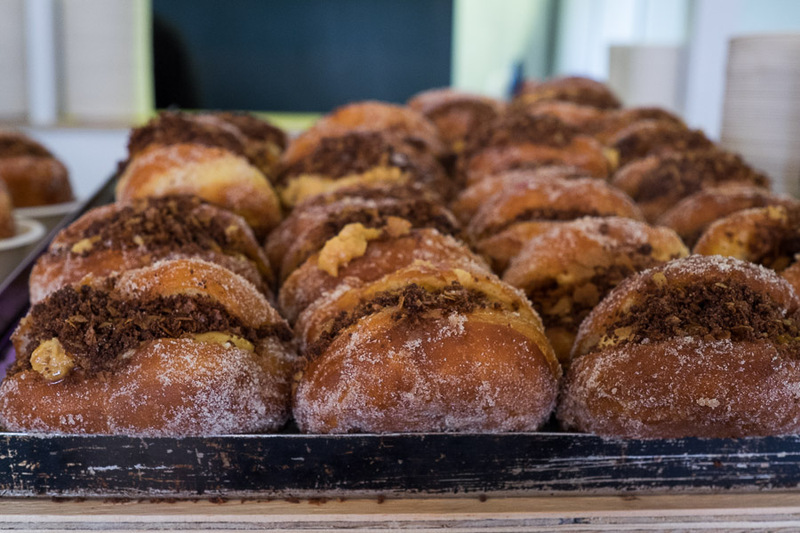 Mary’s: Mary Street Bakery Doughnut – peanut butter, jam and crunch (6 crowns). You can’t go wrong with a well made, generously filled, sugar-encrusted doughnut. el Publico: Street Corn – charred and braised, served with crema, chilli, lime and fresh cheese (6 crowns). The third time I’ve eaten el Publico’s street corn! 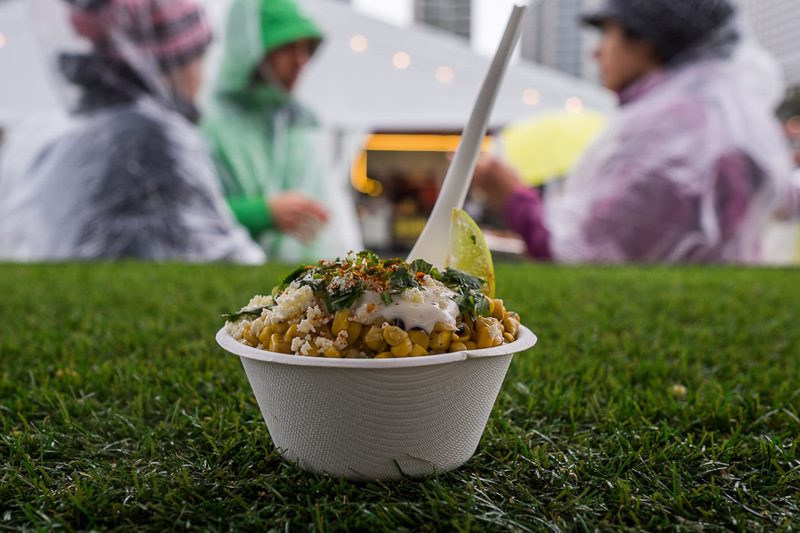 Hot corn was a perfect dish to tuck into while it rained cats and dogs. Next Door at No.4: Croquettes (10 crowns) with taleggio, broccolini, lardo and hazelnut marmalade. 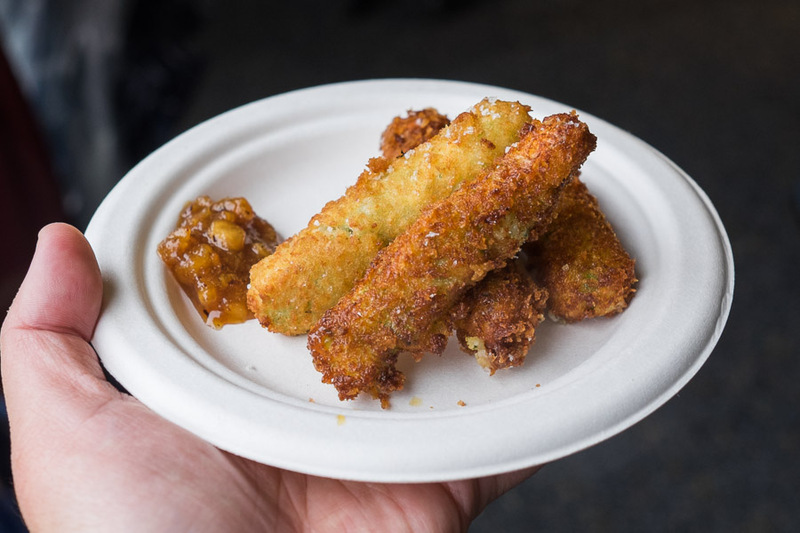 They didn’t look as good as the croquettes I ate at the Taste of Perth preview, but they tasted great – the fingertip-burning crispy coating and gooey cheese were exactly what we needed as we sought shelter from the latest downpour. 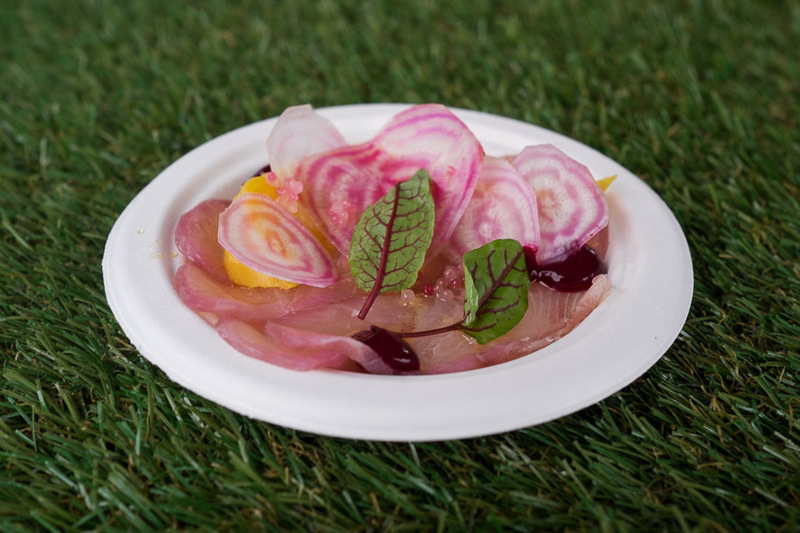 We are big kingfish sashimi fans and tried Bib & Tucker’s Rosella Flower Cured Kingfish (12 crowns) – with beetroot, finger limes and beach herbs. I had honestly thought the beetroot would be used more sparingly so as not to overpower the fish – I was wrong. The dish tasted overwhelmingly of beetroot, the finger limes were all but lost, and even beetroot-loving Jac was disappointed. This was probably the only dish we didn’t enjoy. 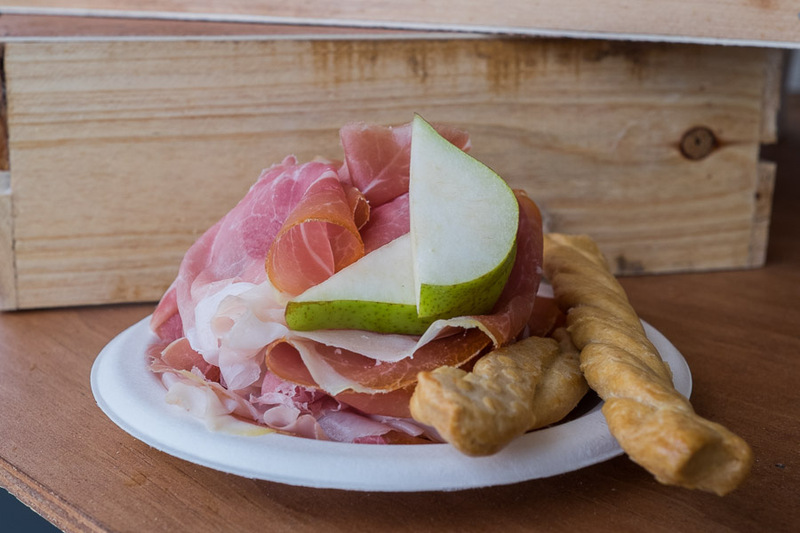 Lalla Rookh Wine and Salumi Store: A mini mountain of seriously good 18-month-old Prosciutto di Parma with fresh pear and grissini (17 crowns). Chef Joel Valvasori on ricotta gnocchi duty at Lalla Rookh. 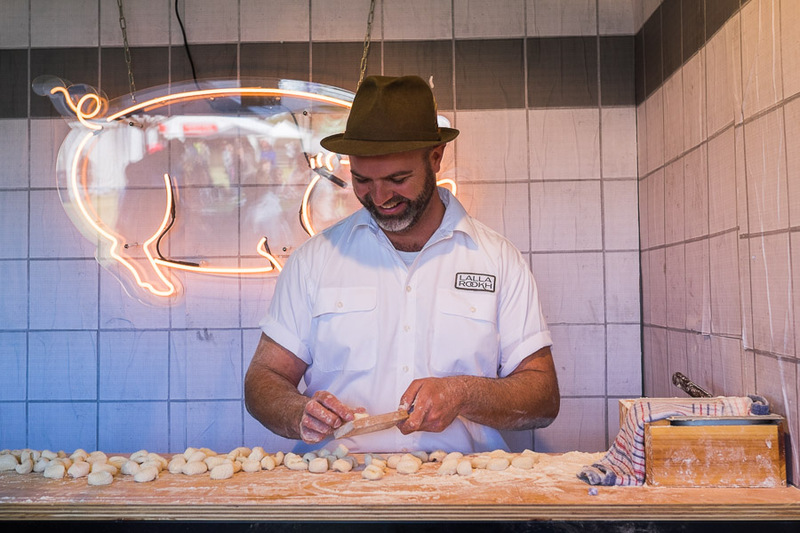 The gnocchi was handmade fresh throughout the day and served with sugo di carne made with organic pork and beef (8 crowns). Chef Valvasori is our city’s Pasta Whisperer – his pasta is the best I’ve eaten in Perth. Silks: Mango Pudding – mango creme, lime crumble, coconut sago and compressed mango (6 crowns). 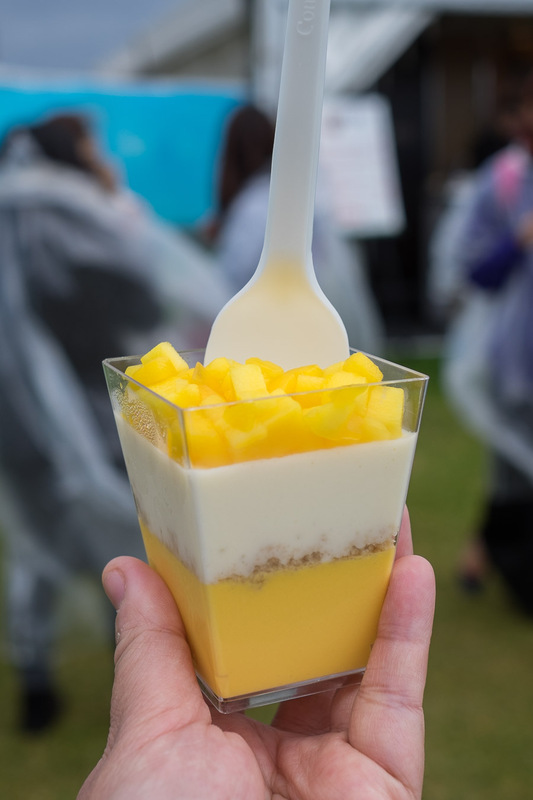 Beautifully presented but not practical for festival stand-up eating; to get a little bit of each layer in a spoonful, the mango would spill over the top. 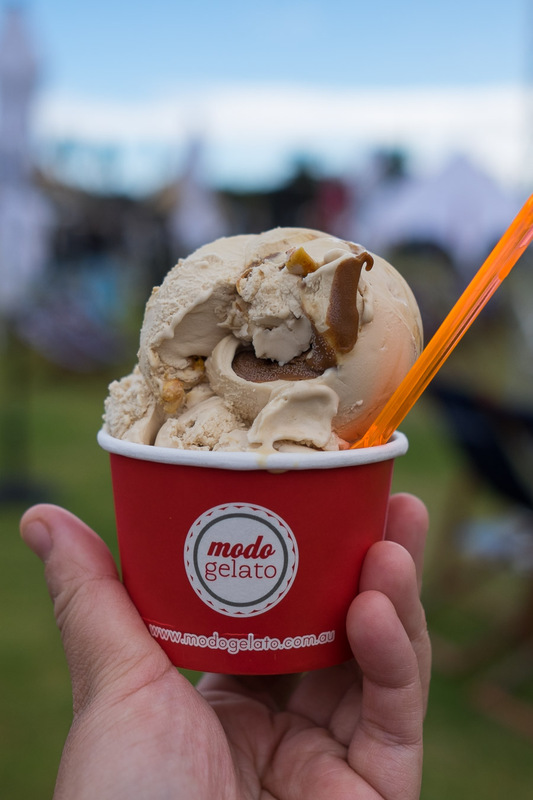 Modo Gelato: Salted Caramel with Honeycomb (6 crowns for 2 scoops). The little red Modo Gelato cart was on its own in a marquee next to the deck chairs. Other gelato flavours included fig strudel, blood orange, dark chocolate and vanilla. 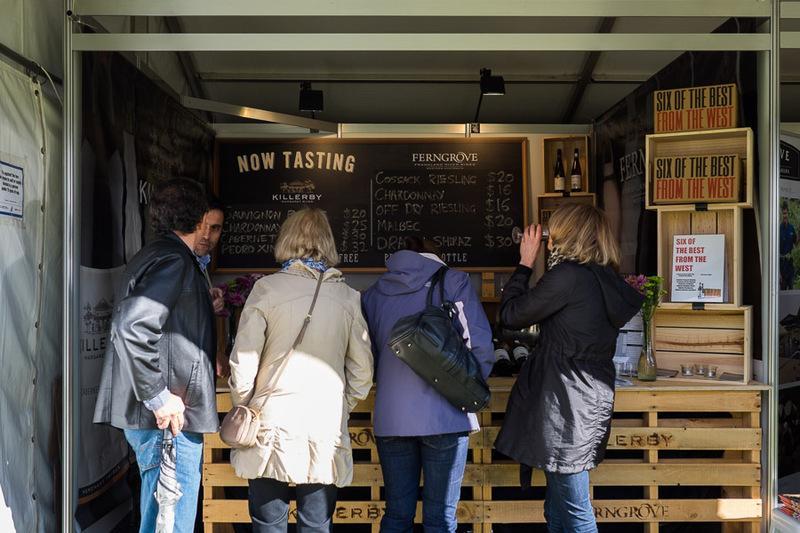 Show special sorbet flavours were Ferngrove Marvelous Malbec and Lalla Rookh Riesling. Did any of you try them? 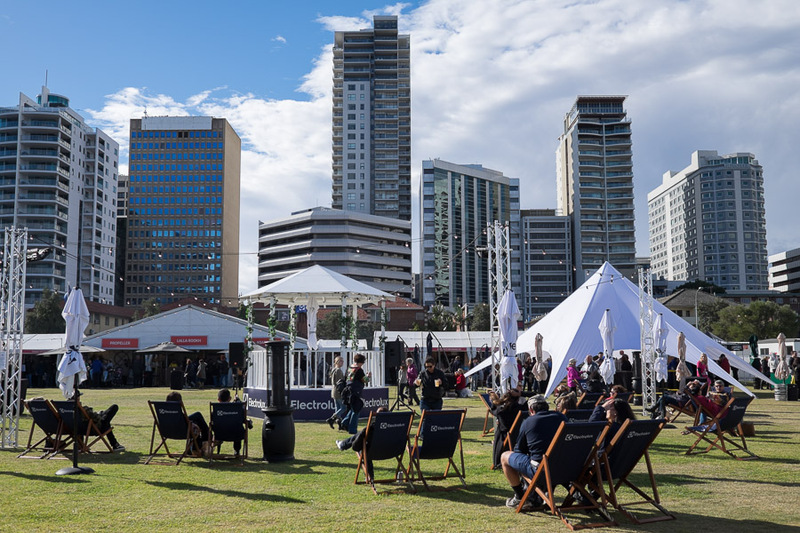 There were four live cooking demonstrations per Taste session in the Electrolux Taste Theatre. 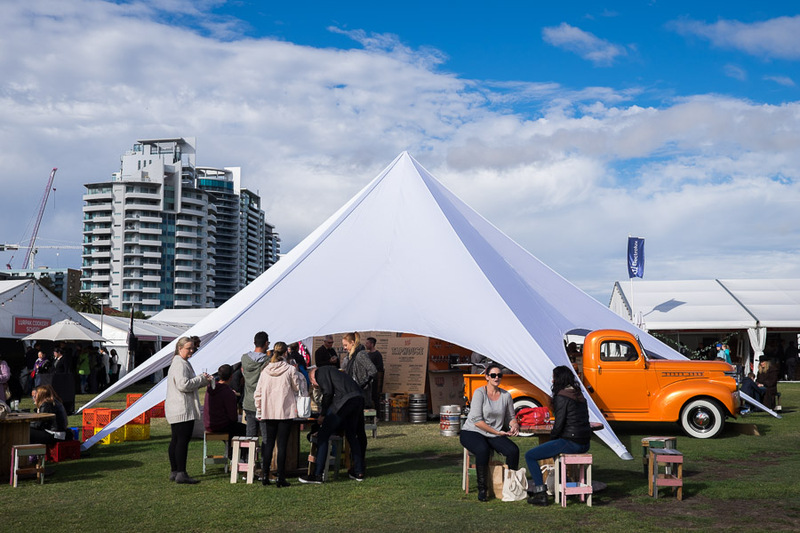 On Friday, I watched Chef Scott Bridger’s demonstration of Bib & Tucker’s Icon Dish – Braised Wallaby Shank (16 crowns) with puffed wild rice and pickled grape agrodolce. Chef Bridger shared tips on pickling and showed us how easy it is to make puffed rice. 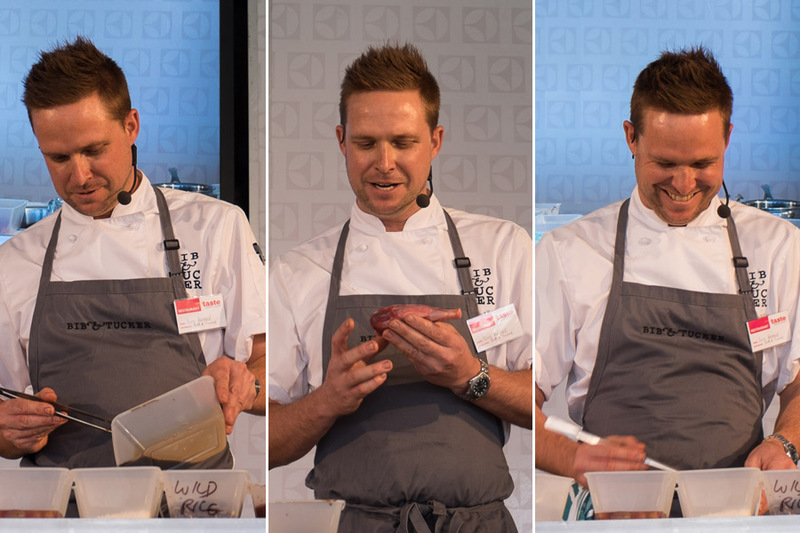 At the Electrolux Taste Theatre, Chef Scott Bridger demonstrated Bib & Tucker’s Icon Dish of Braised Wallaby Shank. 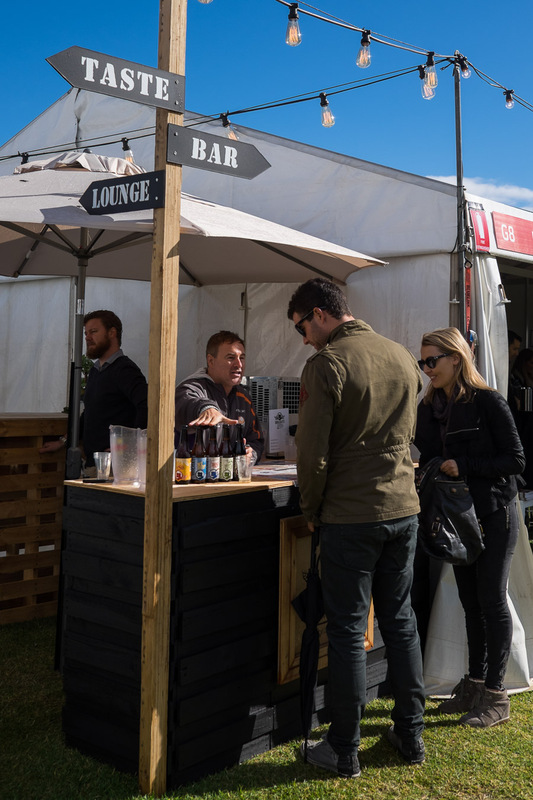 While there were plenty of bars and tastings for booze drinkers, there weren’t so many options for non-drinkers. Bottled water was reasonably priced at 3 crowns, but a juice/mocktail bar would be brilliant next year. It wasn’t all doom and gloom on Saturday; the sun eventually made an appearance just before we left. 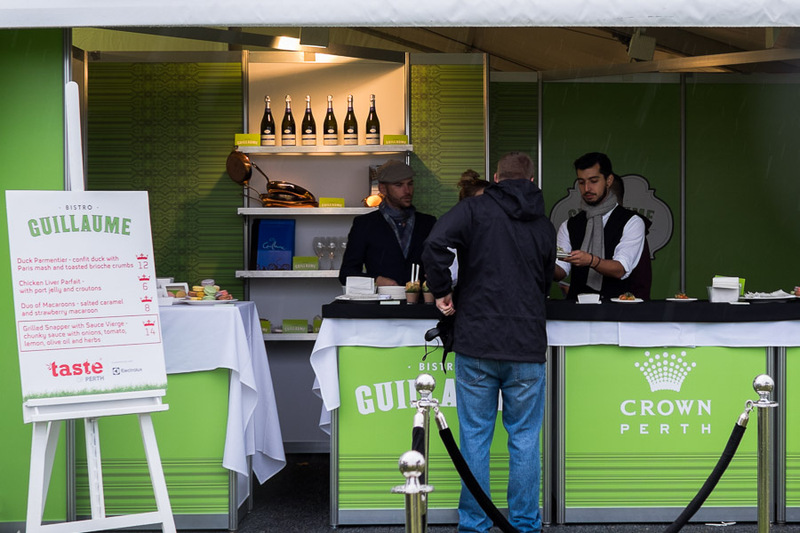 Artisan Producer Market stalls – you could pay for take-home products with crowns or dollars. We tasted Grandvewe sheep cheese, Pic’s Really Good Peanut Butter, The Honey Cake and shamelessly returned multiple times to the Lurpak Cooking School, not for the cookery lessons, but for samples of fresh bread spread with Lurpak butter. We went home with goodies from Turban Chopsticks (really looking forward to trying the Royal Festival Briyani meal kit), Pic’s Really Good Peanut Butter show special (two jars for $10) and a 4-pack of Custard & Co Vintage Dry Apple Cider ($20). 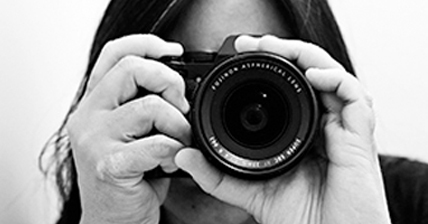 It’s difficult to take photographs in very heavy rain and I didn’t get all the shots I wanted. But we had a great time and ate some truly fantastic food (me, on both days I attended). If the conditions had been better, we’d probably have stayed longer on Saturday. Hopefully we’ll be luckier with the weather next year. 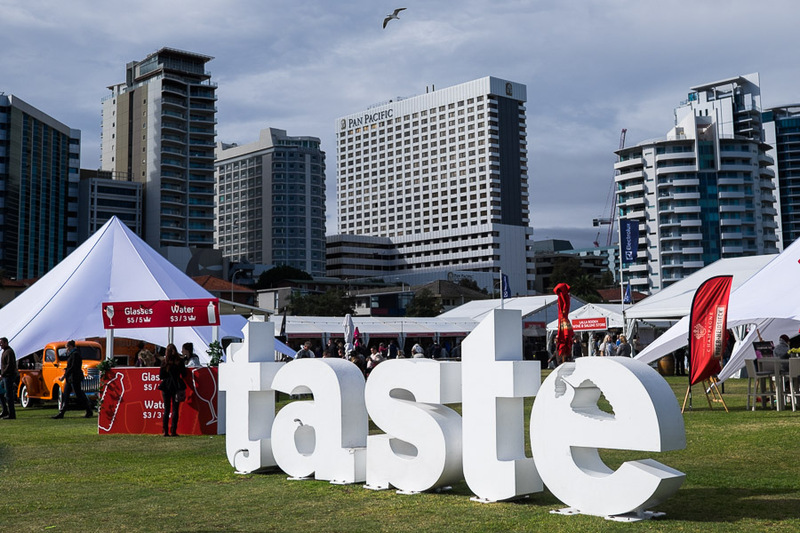 Taste of Perth 2015 was held at Langley Park, Perth CBD on 15-17 May. 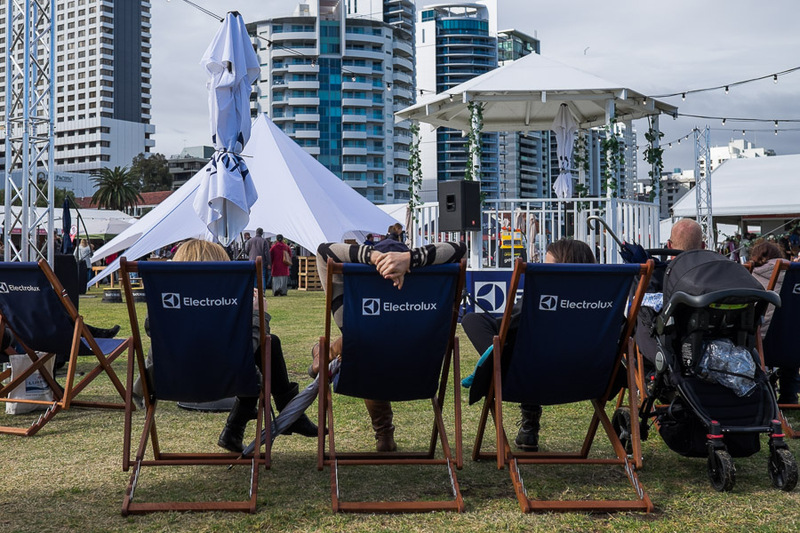 TFP attended Taste of Perth Friday lunch as an invited VIP guest of the festival major sponsor, Electrolux. The dishes I sampled for free as a VIP guest were: Nobu’s Carpaccio, el Publico’s Lamb Ribs and Bib & Tucker’s Slider. VIP guests were each given 30 crowns to spend at Taste, and the following dishes were purchased using gifted crowns, either from my card or another guest’s: Mary’s Fried Chicken Wings, and Asado’s Lomito, Ceviche and Burnt Banana. 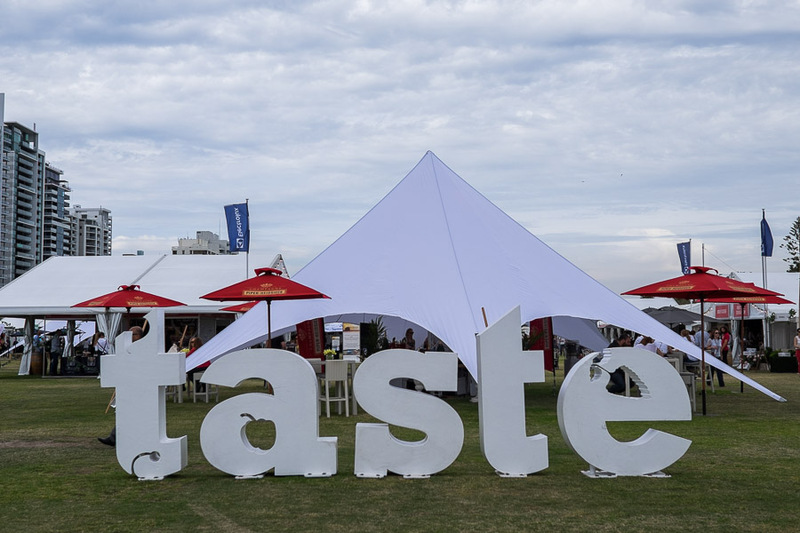 TFP and Jac then attended Taste of Perth on Saturday using General Entry tickets with compliments of Brand Events Australia. The first 16 crowns we spent on Saturday were the last of my gifted crowns; the rest of our purchases were paid out of our own pocket. As always, all opinions expressed are my own, based on my experience at the event. Prices have been included for all dishes, for your information.